3 Eastern Shrines Shiki Tour (四季の旅・東国三社ツアー) is one of the popular power spot tours around Tokyo. It will visit all 3 great shrines of Eastern Japan. Kashima and Katori shrines enshrine the gods of warrior who also great for the achievement. They have the beautiful forest with fill of powers. It also visit the one of the oldest shrines in Eastern Japan. These three shrines give you the tremendous amount of power to you. It's easy and reasonable one day bus tour. Let's ride on. Kasihma Shrine is the one of the oldest Japanese shrine located in Kashima, Ibaraki. The shrine appears in Japanese myth and it said Kasihma Shrine was built in B.C.E. 660 by the first Japanese Emperor Jinmu. 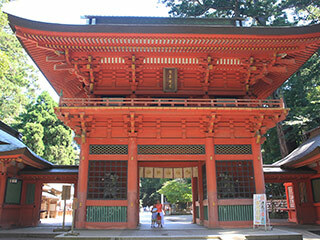 Kashima Shrine enshrines Takemikazuchi who is the god of warrior. Kashima Shrine and Katori Shrine, which enshrines Futsunushi no kami who is also the god of warrior, are the sacred place for all martial arts and worriors in Japan. Therefore. many Dojo (Japanese martial arts school) have their spiritual scrolls for their success and eternal prosperity. Because the shrine is the sacred place for all samurai and warrior, many samurai and shogun worshiped this shrine. Katori Shrine is one of the oldest Japanese Shrine located in Kator, Chiba. The shrine appears in Japanese myth and it said Kasihma Shrine was built in B.C.E. 643 by the first Japanese Emperor Jinmu. Katori Shrine enshrines Futsunushi no Kami, the god of warrior. As well as, Kashima Shrine, Katori Shrine is very important place for all Japanese martial artists. Many Dojo (Japanese martial arts school) have their spiritual scrolls for their success and eternal prosperity. Ikisu Shrine is one of the 3 eastern shrines located in Kamisu, Ibaraki Prefecture. It was established in the period of 10th Emperor Ojin. This shrine is older than two other shrines. It has the divin ponds of pure water even nearby ocean. This water was very important for ancient Japan. If the water is clear, it will bring the good luck. In Edo period, worshipping three Eastern Shrines was next most popular tourism besides Ise Shrines. Kashima Shrine, Katori Shrine and Ikisu Shrine are located in Chiba and Ibaraki. They are considered as one of the most powerful power spots. These three shrines are located exactly on the perfect Isosceles triangle. If you visit them, it will give you the power of nature. 1. Only 5800 JPY reasonable tour. 2. Visiting all the spots by bus. So, it is very easy. 3. the guide will take you all the time. So, it will be very safe and easy for the beginners. 4. Welcome one person. Seat will be place with the same gender. 5. Visiting all Kashima, Katori and Ikisu Shrines. 7:30 meeting at Shinjuku Metro Building Parking. Michinoeki for lunch Time 60min. Katori Shrine Time 80 min. 18:30 back to Shinjuku Station.